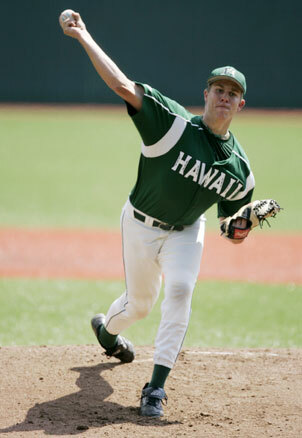 Junior transfer Jared Alexander has gone from being a third or fourth starter for Hawaii into the ace of the staff. He brings a 6-3 record and 3.24 ERA into tonight's game against Sacramento State. If you're lucky, he'll give you a sentence or two after he pitches. When: Today, 6:35 p.m., tomorrow (2) and Sunday, 1:05 p.m. If he throws a shutout, maybe you'll get three. Junior Jared Alexander is a man of few words, but has been anything but silent for the Rainbow baseball team this season. Alexander developed from a possible third or fourth starter to the team's ace this season and will start the opener of Hawaii's final WAC home series tonight against Sacramento State. The crafty right-hander has never been one to overwhelm opposing hitters, but his innate ability to pound the strike zone with four different pitches has resulted in one of the biggest surprises for head coach Mike Trapasso this season. 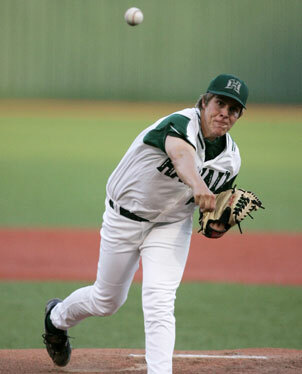 Jared Alexander is the only UH pitcher to have started at least once each weekend. Jared Alexander left quite the first impression on catcher Landon Hernandez. "When I first caught him in fall ball, I was just like, 'Eh, this is another average guy, you know,' " Hernandez said. Prior to UH: Attended Cosumnes River College in Sacramento, Calif. ... Played baseball and was first-team all-conference. Personal: Born June 5, 1986, in Sacramento, Calif. ... Intends to major in sociology. ... Has one sister. ... Parents are Brenda and Jeff Alexander of Sacramento. Alexander, a junior right-hander, didn't bring with him the same expectations as teammate Alex Bates had from Cosumnes River College. Bates and returning junior Matt Daly were pegged as the top starters on the team before the season began, but an injury to Bates and control problems for Daly opened the door for the subdued Alexander to maneuver his way as the team's opening-series starter. Thrust into a situation he hasn't experienced in his career, Alexander has excelled, going 6-3 with a 3.24 ERA in 11 starts. He's the only pitcher to have started at least one game every weekend this season. "None of us expected him to have the success he's had starting for us," Hawaii coach Mike Trapasso said. "The thing we didn't know about was his poise and maturity on the mound. He never seems to get rattled. He stays on an even keel." Since breaking his throwing wrist as a senior in high school, Alexander hasn't had much practice as a starter. He only threw close to 30 innings his last year in high school and was used primarily out of the bullpen in junior college. "It is a big difference, but it's fun," Alexander said of becoming the staff ace. "Lots of hard work has paid off." Not one to say many words, Alexander has a low-key personality that fits his pitching style to a tee. He doesn't have the overpowering fastball to blow hitters away, and doesn't have the kind of stuff that makes your jaw drop. But what he does have is an uncanny ability to paint the corners and throw strikes at an alarmingly high rate. No matter how the game is going, he'll stand on the mound and continue to pepper away at the strike zone with an assortment of effective pitches. "I had an idea (he'd be a starter) just because he threw a lot of strikes in the fall," Hernandez said. "He'd throw 17 pitches for strikes out of 20. I didn't know about (being) the Friday night guy, but it's worked out for him." Alexander has given up 77 hits in 77 2/3 innings pitched this season, which isn't great, but he minimizes the problem by not giving away any free passes. He has only walked 15 batters this season, and has a strikeout-to-walk ratio close to 4 to 1. "I just hate walking guys," Alexander said. "I'd rather you get a hit and earn it than me messing up and throwing four balls." Playing in a pitcher-friendly ballpark like Les Murakami Stadium has also helped Alexander. He has an above-average slider and cutter and has added a changeup under Trapasso's tutelage. Mixing those pitches with his ability to throw strikes early has led to some success at home. He's 5-1 in six home starts and has given up seven earned runs in 45 2/3 innings with 35 strikeouts and 12 walks. "Pitching in this yard with the ability to get ahead in the count and then throw his other pitches has been good for him," Trapasso said. As a control guy who doesn't try to overpower opposing hitters, it's no surprise who Alexander patterns his game after. "Greg Maddux," he said. "Not overly powerful, but hits his spots and gets guys out." Just like Alexander's scouting report.